It’s been a while since I’ve stumbled on a new restaurant in town. The Gazette has actually been doing a really good job of beating me lately (not that I’m competing with them or anything), but the other day I was driving down Riverview Drive to head out of town through Parchment and I noticed an old building that had a new sign and an open sign in the window. 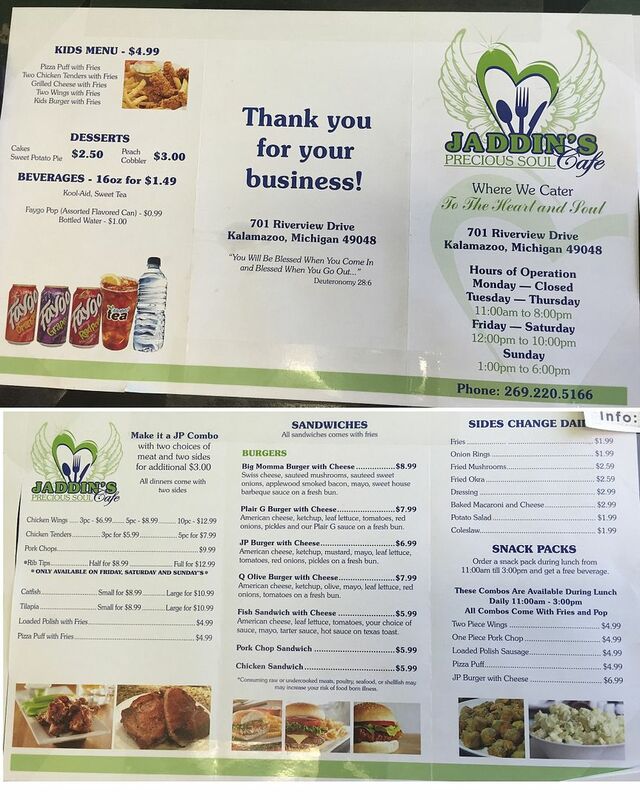 The new restaurant is a soul food café called Jaddin’s Prescious Soul Food Café. It’s on Riverview Drive near the intersection with Hotop in the Eastside Neighborhood. 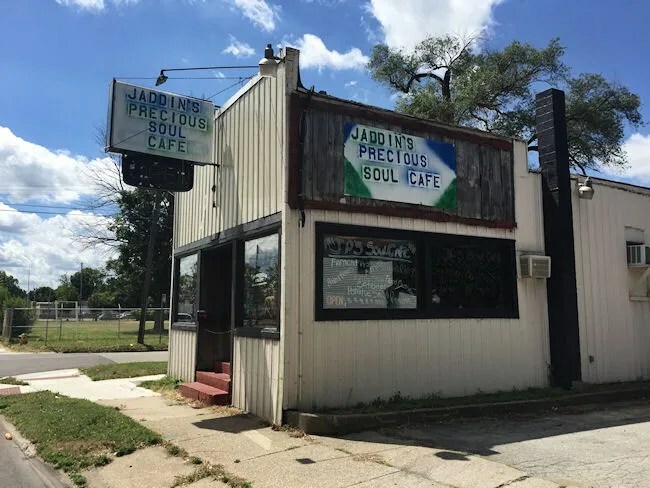 Since I’ve been in Kalamazoo, the small, rundown building has been several different versions of a soul food or BBQ restaurant. The last one I actually went to was Beale St. BBQ although I believe I remember seeing a different sign on the building between that version and this one. Jaddin’s Precious hasn’t really changed much of the restaurant layout. You order at a large counter when you walk in the door which is on the side of the building next to the parking lot. There’s a small dining room near the front of the space if you chose to dine it. The restaurant looks like it’s been open since the beginning of the summer and while I may not have noticed it, others have. There were quite a few people sitting down eating in the dining room when I stopped in on a Friday afternoon and there were a couple of carry-out orders ahead of me. It was just L and I. J had to work late so L and I went to play at the park then out for lunch. L wanted McDonalds, so I stopped and got her a Happy Meal, so really, it was just me who needed lunch. 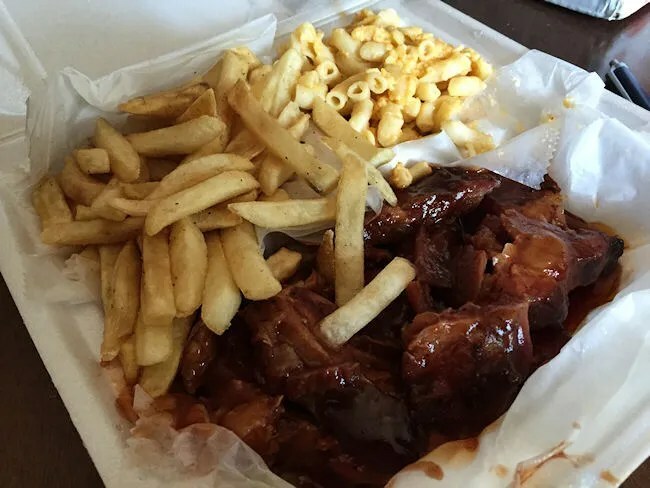 The soul food menu has a lot of sandwiches, including burgers, catfish, talapia, wings, pizza puffs, and a lot of rotating home made sides, but on weekends, they have rib tips. Oh, how I love a good rib tip. 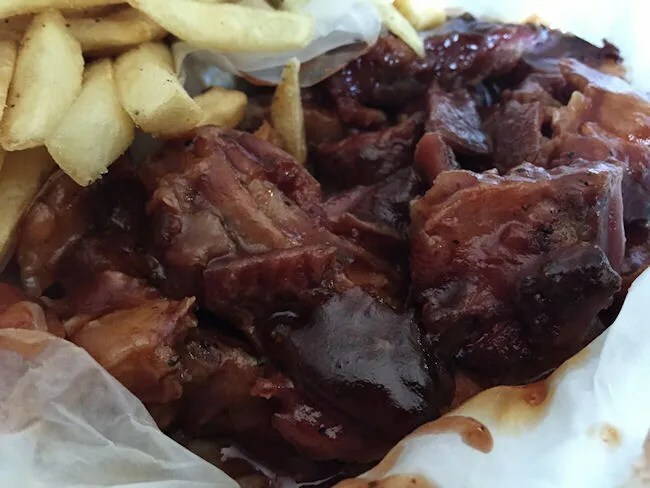 Of course, I ordered the half order of rib tips. It came with choice of two sides. 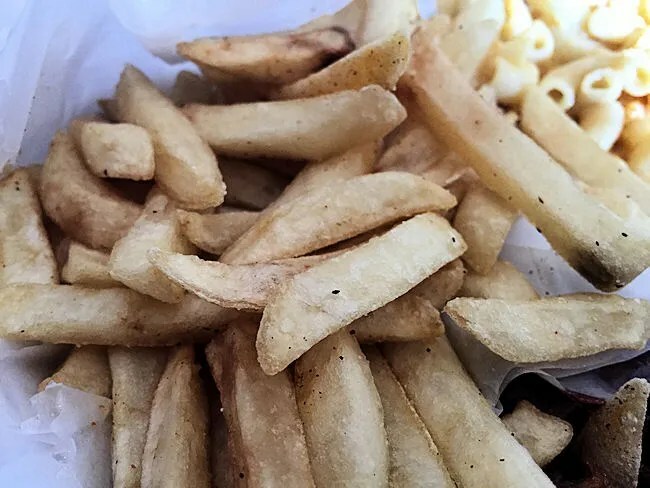 I chose fries and the baked macaroni and cheese. The cost was just under $10. There are a couple of lawn chairs set up as a waiting area and after finding a potty for L, we took a seat and waited. L was being good, but wanted to go, so she and I started playing some games to pass the time. The lady working behind the counter commented on how good she was being and asked if she wanted a juice. I said it was ok, so she grabbed one of those little barrel juices and gave it to her. A few minutes later, a different lady came out and did the same thing. She didn’t need two juices, so I thanked her, but declined that one. However, little things like that do leave a lasting impression on me. Those juices probably cost them less than $.50, so it’s not huge, but it’s a small gesture that leaves me with a good impression of the people who run the place. It took about ten minutes to get my food then L and I headed back to my truck to head home. She had already eaten most of her McDonalds, but I was hungry and couldn’t wait to get home. When I did finally make it home, I started with the baked macaroni and cheese. I have to say, this was surprising. It was delicious. 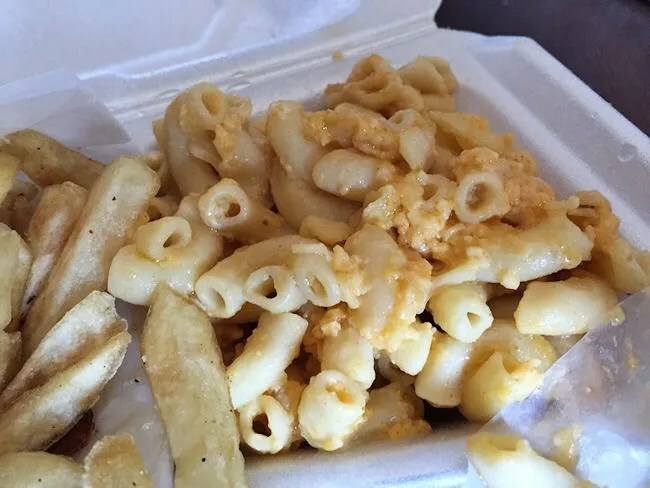 The mac and cheese was very cheddary. I wanted more and would go back and just order a whole entrée if I could. The started in the fries second. They were pretty standard fries. Nothing special, but there was a lot of them and they were good in the leftover sauce from the rib tips. The rib tips were delicious. There was a mix of really, really tender pieces and pieces that were a little on the tougher side, but overall, there were more tender than not. What I really enjoyed is that I got pretty lucky and didn’t end up with a lot of pieces that included the little bones. 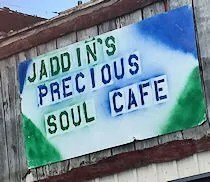 I liked Jaddin’s Precious Soul Food Café. I really did. The food was delicious and the people were fantastic. There’s been so many restaurants go in and out of this building, but I hope this one sticks around…..and they offer the rib tips all the time. Me And My Sister Stumbled Across This Wonderful Article Of My Restaurant And We Where In Complete Awe… I Am A Humble Person But To Read This Has Humbled Me More. I Am So Thankful For My Sister And Family Who Help Me Daily To Serve Great Food With All My Heart And Passion To Great Customers. I Thank You For The Awesome Feedback And We Are Considering Serving Tips Daily.